Could the Nixon Mission be *the* smartwatch that has a good reason to exist*? Based on the look, feel, and practicality of the device, I’m leaning toward a ‘yes’. 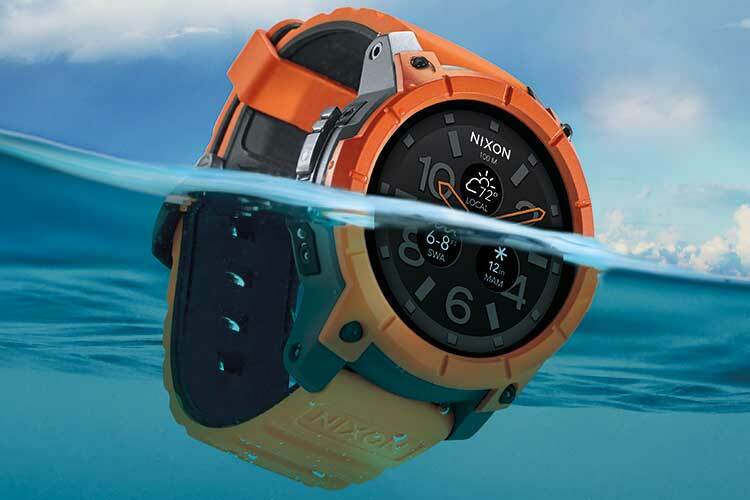 The Nixon Mission is a smartwatch designed with water activities in mind, in either the liquid or ice form. Surfers, skiers, and lovers of rugged, round watches, this one’s for you! The Mission is water-resistant to 100 metres. Its case is made from a blend of polycarbonate, with a bezel made from 316L ‘surgical grade’ stainless steel, and Gorilla Glass protecting the AMOLED screen watch face. Android Wear is the operating system of choice, aided by Google Fit activity tracking. It will be one of the first watches to use Qualcomm’s Snapdragon Wear 2100 system-on-chip – it’s smaller, optimised for better battery life even in its always-connected via low power Wi-Fi and Bluetooth states, and uses smarter sensors. Pre-loaded apps include the Nixon Mission app, armed with partnerships with the Surfline and Snocountry apps, will provide real-time surf and snow connections respectively. The Nixon Trace App allows users to track sessions and view stats. “With current products splash-proof at best, we knew we had to create a smartwatch that could survive the surf or the first ride down the mountain. We developed the watch in tandem with our world-class surf and snow athletes who lead demanding, rigorous lifestyles. By listening and implementing their feedback, The Mission became a unique collaboration between our athletes and our product team: we’ve created the 4×4 of smartwatches, ruggedly built for extreme situations,” wrote Tyson White, Vice President of Product at Nixon on the company blog. The watch has just been shown a the 2016 Baselworld watch show. It is slated to go on sale at select retailers, Nixon stores and online at nixon.com. The price, in the US at least, will be $400. For more information, and a closer look at the watch and its features, check out the video at the top of this story. *My opinion on smartwatches laid bare. Again.